Finding time to relax with a busy lifestyle seems impossible, which is why you need to find ways to relax throughout the day. This can have a significant impact on your life, and leave you with a much relaxed and stress-free body and mind. 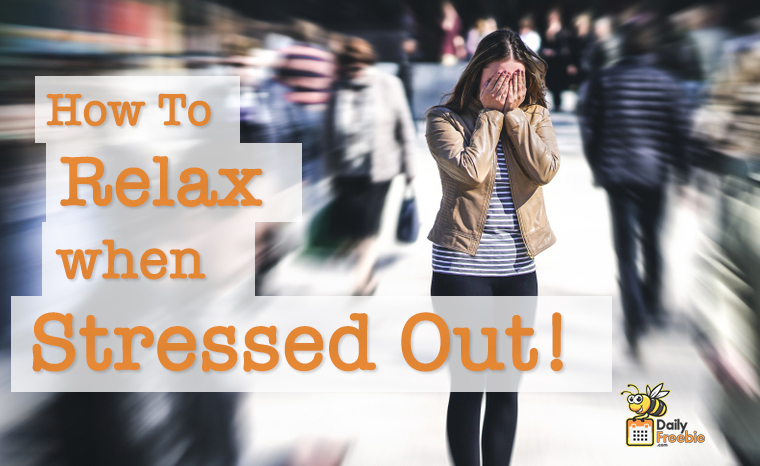 To help you out we have listed down 10 ways to relax when stressed out. Tryptophan – A lot of people reach for food when stressed, a common habit as food can help relax your body and mind. This is due to the fact that food contains tryptophan that can help you unwind and relax. Tryptophan is present in most protein-based foods or dietary proteins. Be Active – An easy way to relax is by adding an activity to your daily routine. You might feel that laying down or sitting would be a great way to relax, but when you are stressed your mind needs an activity that can distract it which is why you should consider going for a quick run around the block or hitting the gym. Working out the stress will help you relax your body and mind. Breathing – Learning a few breathing exercises will definitely help you out in stressful moments. Your heart rate increases when you experience stress. Slow, deep and controlled breathing lowers your heart rate quickly and can have immediate effects on your stress level and mental state . Music – Music is food for the soul and can help you go from panic mode to melodic mode in a few minutes. Listen to any music that puts you in a good mood so you can relax at any given point. The best way is to keep the music on your phone and your earphones ready to go. Chocolate – Chocolate is the most popular calming treat in the world. Its sensational taste releases a sense of calmness to your body and mind leaving you with a more relaxed feeling. Moreover, it contains anandamide which is a neurotransmitter that adds a peaceful sensation. Hug – One of the easiest ways to relax is by hugging someone you love. Knowing that you have someone who loves and cares about you can easily bring your anxiety levels down. Psychologically it helps soothe you, and physiologically it releases the love hormone in your brain that instantly relaxes you. Pamper – Treating yourself is a concept only a few individuals are familiar with, but something that works wonderfully. We suggest you take out time to pamper yourself, so you can refresh and reboot before jumping back into a stressful environment. Laugh – Laughter is the best medicine, as it has a great therapeutic effect on your mind. You can take on a laughter therapy class, a laughter yoga class, or just get together with any family or friend that makes you laugh. Aromatherapy – A soothing and relaxing journey that relaxed your body and mind, regardless of where you are. We suggest investing in a portable diffuser and your favorite essential oils. Making sure you are covered when at home, driving, and when in office. Live – Learn to live in the moment, as worrying about something that might never happen is pointless. You need to live in the moment and cherish the good times that come your way, fighting the urge to think about unnecessary thoughts that can cause anxiety or stress. Hopefully these 10 tips lower your stress level and allow you to have a calmer and more productive day.